The Pit Indoor Kart Racing is one of North Carolina’s premier entertainment facility. 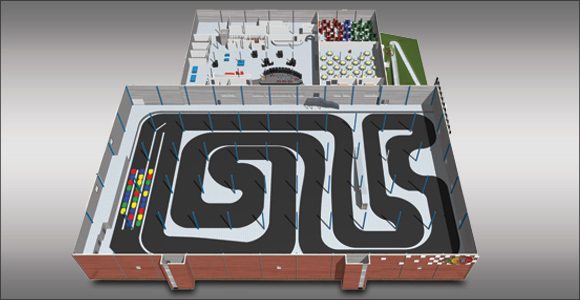 With over 140,00 square feet, The Pit is your place to gather with friend and foe to experience the adrenaline rush of indoor kart racing. We offer high-speed Go-Karts, over 65 Arcade Games, 4 Billiard Tables, Laser Tag Arena, Black Light Mini-Golf, Cannonball Air Blaster, Spin Zone bumper cars, and a 24ft Rock Climbing Wall. We also provide free Wi-Fi and a viewing area overlooking the kart track with 6 wide-screen tvs. We opened just the kart track on December 28th, 2007 with the upstairs (arcade and laser tag) opening later in the spring of 2008. Since then we’ve added faster go-karts, black light mini-golf, cannonball air blaster, a rock climbing wall, Spin Zone bumper cars, 6,500sq-ft banquet room, and a fully furnished executive style conference room. Simply put, we have over 140,000sq-ft of floor space with activities and event space for any age group! We also do Birthday Parties, Bachelor Parties, NASCAR Race Team Functions, Team-Building, Corporate Events... You name it; we’ve hosted it. Hey, we’ve even hosted a few weddings! What’s better than taking a victory lap after you’ve tied the knot, right? We get asked a lot about our location. We’re about 30 minutes (depending on traffic) north of downtown Charlotte in Mooresville, which is exit 36 off I-77. From exit 36 you’ll head east on Hwy 150 (also known as East Plaza drive) for about 2 miles. The Pit Indoor Kart Racing is the large red-brick building on the right just after the Burger King (which we’ve driven though their drive-thru with a kart before :D ). Got questions? We have answers! If you have a question about an activity then take a look at the bottom of each specific activity page for frequently asked questions about each activity. For all other questions click the “FAQ” tab in the navigation menu. Still didn’t find an answer? Give us a call at (704) 799 – 3470. Be sure to give us a “Like” on our Facebook page. We’ll update you about our Monthly Specials and we also post weekly Free Race Giveaways here too! We first opened the kart track on December 28th of 2007. We had a grand opening to the public later in January. The arcade and laser tag (upstairs) opened later on May 10th, 2008. We have added other activities over the years. Visit our Job Opportunities page for details, our application form is at the bottom. Please read everything on the page before applying. Due to the high number of applications we receive please do not ask to speak with the owner or manager. This will not increase your chance of getting hired.